Charleston is on the diagonal in more ways than one, veering from the straight and narrow of Southern gentility. Coworking spaces and young creatives have moved into downtown’s elegant 19th-century homes, which gravity, age, and history have caused to lean like the ancient trees that shoot in all directions from the sidewalk. One local affectionately identified this as The Charleston Slant. 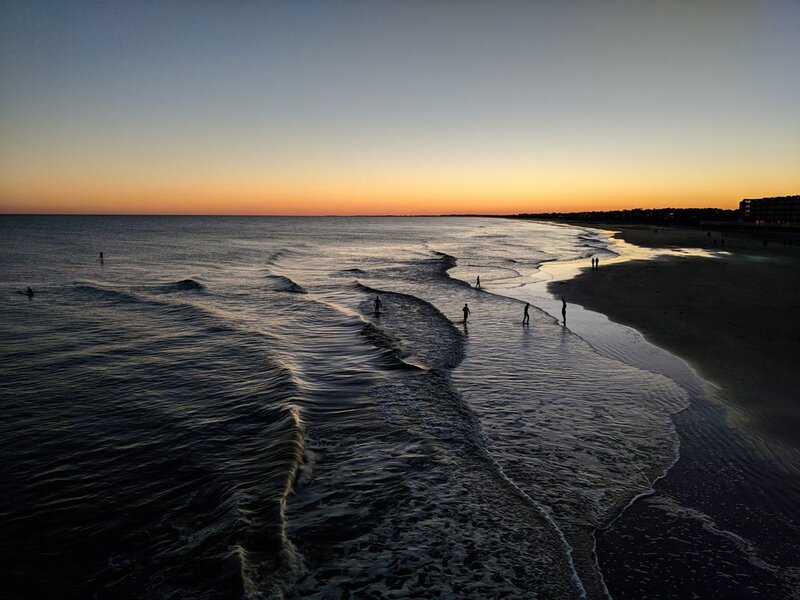 The city’s off-kilter currents are personified in Folly Beach, a short drive away. To make the most of a long weekend that touches it all, here’s what I recommend. And what I don’t. So get up close with history - grasp the terror felt by American revolutionaries held prisoner by British forces in the Old Exchange and Provost Dungeon. Or the triumph of Emancipation celebrations that still preceded decades of racism and violence. Process your thoughts on a bench swing in Waterfront Park, next to a series of plaques that show the expansion of America’s “first planned city.”* In short, experience Charleston as it is now, without minimizing its past. One of my unexpected favorite spots in Charleston was a relative newcomer, a bar that inhabits the original location of an iconic early-twentieth century corner store by the same name. Every city should have a place like Harold’s Cabin, both really cool and really cozy. Their forage board is a pile of vegetables presenting you a bouquet of (edible) flowers, and you feel bad for eating something that was so sweet to you. But you'll get over it. Bar Normandy, meanwhile, is a restaurant pop-up in a bakery, lauded for its creative culinary prowess. Just as delicious as the food is the novelty, underlined by subway tiles decorated by dry erase marker and the knowledge that the menu can, and will, evaporate by morning. Exhibit A: “Let me tell you about our wildly inaccurate menu,” the bar manager introduced a board describing yesterday’s offerings. In Japan earlier this year, I was surprised to find the curry tasted more like Southern gravy than the heated Thai or Indian variety. Turns out the chefs at Husk feel the same way. The sauce on their grilled broccoli, served in a cast iron skillet, took me back to Tokyo, though at first I couldn’t recognize why. The server had the answer: Japanese curry! It was innovative, and most of all, good. But the rest of the meal didn’t live up to the price, or the hype. Instead, Husk’s sister bar, next door, stole the show. Stop by for a drink - specifically the Midnight Run - and share the shaved ham, served staunchly on a bourbon barrel stave. Then skip dinner next door. An intermission, to discuss coffee: Both Kudu Coffee and Craft Beer and Harbinger Cafe and Bakery had delicious brew; Harbinger was set apart by next-level food, from mix and match salads to desserts involving Earl Grey, gianduja, and sriracha. Black Tap Coffee, on the other hand, looked better than it tasted. Caffeine acquired, back to business. The adorably named YALLFest, the largest young adult book festival in the South, had taken over Blue Bicycle Books, the fest’s host and founding business. The King Street bookstore is worth a visit with or without the impressive line-up of author signings and panels. Finally, at Prohibition we found live music, played so quietly the crowd easily drowned it out. We absconded instead to an enchanted back patio. There we met a couple around the fire pit, and when asked what their plans were for the weekend: “Well… we got married today.” I bartered cat pictures for wedding shots, exchanged numbers, got recommendations, and left the patio celebrating love and a city that knows how to make you feel it. Homebase was a teensy AirBnb in Folly Beach, a quirky, surfy beach town a far cry from the city’s four other satellite beaches, which trend more posh than eccentric. We split our time between Folly Beach and Charleston proper; I suggest you do the same. Once in Folly, everyone said it: You gotta go to Bert’s. So we did, and drank free coffee while waiting for breakfast burritos and gathering supplies for the weekend. We fell, a lot, but managed to ride a few waves to shore. Battered by the surf, we self-medicated with the best burgers on the beach at Drop In Deli. I opted for veggie, but to my travel partner the dive bar delivered, with Ron Swanson simplicity, a burger so good we stopped again on the way to the airport so he could get one to go. We’re three days from Thanksgiving, and if you want some inspiration, it turns out Vietnamese brunch nestled in a Neapolitan pizza parlor will really make you thankful… that you’re travelling with someone else. That means you don't have to choose between the carbonara pizza and bánh xèo. If you’re there on the weekend, The ‘Wich Doctor is a must. The bar supervisor at Harold’s Cabin, Drew, told us he moved with his wife to Charleston after years in NYC. Before launching into a list of truly excellent recommendations for our stay, he said “You can’t just move from New York to any city.” He’s right. It turns out the Charleston Slant is more than an architectural quirk, but a phenomenon of individuality emerging in each element of the city - and possibly the only thing that allows it to be mentioned in the same breath as the Big Apple. It makes Charleston worth a visit, and maybe more. Have playlist suggestions, or recommendations for doing it better next time? Share with the class using #HireLiaNYT! *A little research shows Savannah also claims this title. Any city planning buffs have insight into who has the rightful claim?